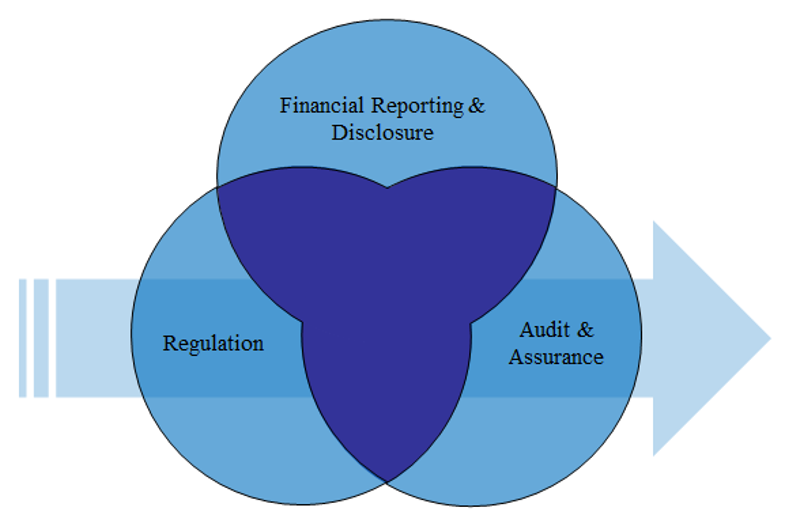 Our research focuses on the intersections of three different research areas: (1) financial reporting and disclosure, including international financial accounting standards and non-financial disclosures such as sustainability and integrated reports, (2) financial and non-financial disclosure regulations, including EU directives and innovative types of regulations, and (3) audit and assurance services, including audit fees, auditor characteristics, scope and level of voluntary assurance engagements. Topics such as digitalization and information technologies, e.g., social media or cloud-computing, substantially influence the finance and accounting world in different ways. Managers need to rethink traditional business models in order to meet new stakeholder expectations, for example, regarding transparency in environmental, social and governance matters and the corporate use of social media channels for stakeholder communication. Thus, the management is constantly challenged to make decisions about the company’s strategic and operative directions under uncertainty in a dynamic and fast-changing environment. How do new EU directives on non-financial disclosure influence the disclosure decisions of firms ex ante? How does a new reporting regulation affect the capital market? What effect does the compensation policy of a firm have on the management performance? How can individual manager goals be aligned with the sustainable goals of a firm? Does an auditor change have an effect on the market value of a firm? What factors determine a firm’s choice to seek additional assurance services on a voluntary basis? How does the age of digitalization change auditor behavior? How does the rising corporate use of new information technologies affect stakeholder communication and their decision-making process? Our focus is on empirical studies that are based on archival data. To examine interdisciplinary research questions, we apply different research methodologies in combination with different theoretical underpinnings, such as using behavioral, sociological, or psychological hypotheses. Since archival research cannot clearly indicate causality, endogeneity of independent variables, for instance, is a common concern. To alleviate this concern, we use quasi-natural experiments in our empirical studies (e.g., the enactment of sustainability disclosure regulations or other economic shocks), as well as additional robustness checks to control for self-selection bias (e.g., Heckman two-stage estimation or propensity score matching). Further, experimental research designs allow identifying causal effects, which offer new opportunities for the examination of research questions, for example, regarding the information processing of stakeholders. Our research projects are regularly presented at national and international conferences and workshops, including the Midyear Meeting of the Auditing Section (AS), International Accounting Section (IAS), Management Accounting Section (MAS) or Annual Meeting of the American Accounting Association (AAA), the Annual Congress of the European Accounting Association (EAA), the German Annual Accounting Conference or the Annual Conference of the German Academic Association for Business Administration (VHB). We publish research results in international peer-reviewed journals (e.g., Journal of Business Ethics) as well as in relevant journals for practitioners (e.g., Zeitschrift für internationale und kapitalmarktorientierte Rechnungslegung (KOR)).